[Occupied West Bank] At approximately 7am this morning, Palestinian, Israeli, and international human rights activists were detained while attempting to block the demolition of part of a Palestinian familys home, near the village of Masha. The building had been slated for demolition by the Israeli Military because it lay in the path of the Apartheid Wall that Israel is building on occupied Palestinian land. 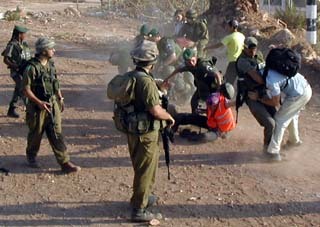 The peace activists were violently thrown on busses by Israeli soldiers and border police. Two internationals were beaten; one, a US citizen from Los Angeles, was repeatedly kicked in the stomach and may have sustained broken ribs. 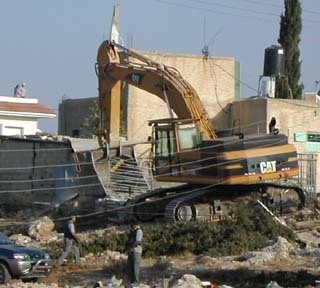 Immediately, a Caterpillar bulldozer moved in to demolish part of the family home (an animal shed attached to the home). 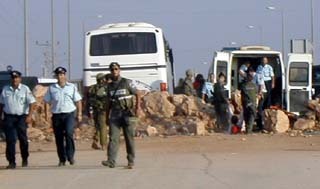 Detainees are being held at Ariel Prison in the illegal settlement of Ariel in the occupied West Bank. One Palestinian and one Italian have been put under formal arrest. The others, the Israeli Ministry of Interior is currently deciding what they want to do with. One option is for them to deport the internationals. To our knowledge, the Ministry of Interior has not yet issued a decision. Please flood the Ministry of Interior with phone calls from around the world, asking that ALL the detainees be released. Let them know that you are watching and protest the Israeli governments attempts to deport peace activists witnessing and trying to prevent abuses against Palestinian human rights. You can also flood Ariel prison with calls demanding the immediate release of all detainees. The best numbers to call are the officers but if they are unreachable, please call the General Info line. You can also email the ISM office at info@palsolidarity.org, but responses to email may be slower. Today Palestinians, along with 50 internationals and 10 Israeli activists prevented the demolition of Palestinian property and blocked the construction of the Apartheid Wall in front of Hani A'amer's house. He and his family live in the village of Mas'ha, where for months Palestinians, Israelis and Internationals have been holding an Anti-Wall camp. If the wall is completed as planned, Hani, Munira and their 6 children will be imprisoned between the Apartheid Wall and the fence of the illegal Elkana settlement. They will only be able to leave the house three times a day under the control of security guards, virtual prisoners on their own land. Bulldozers began construction on the Wall at approximately 7am about 20m from the house. The Israeli Military and police were called in to evict the activists. The Palestinians, Internationals and Israelis linked arms around the property as the owner of the house, representatives of the National Committee against the Wall, the ISM, IWPS, and Israeli peace organizations all held a press conference for the media who were covering the action. Because the activists and the media were there to protect the family, construction was halted for the day, and the contractor informed the protestors there will be no work on the site of Hani A'amer's house for the next two months. However, the activists have pledged to keep a presence in the Mas'ha peace camp erected in front of the house and hold the contractor to his promise . They want to insure that there is no further attempt to continue the path of the Wall. Protesters will demand a written guarantee from the Israeli Defense Ministry that the house will not be cut off from its village. They are also demanding that Israeli Military immediately repair the water pipes of the house damaged by the construction. They have given the authorities until Wednesday to respond, then they will do further action. For generations, people in Mas'ha village in the West Bank have been making their living off the ground beneath them. The olive crop has been a source of income and pride that is the backbone of farming here. Through the region's turbulent political history, farmers continued in their legacy of tilling and harvesting. All of this changed this year as the Israeli government handed the towns people confiscation papers demanding to seize about 95% of all productive lands. This shocked the villagers, among them Na'azi Shelabi, a father of seven who depends on his crop to make a living. As shock became despair, Na'azi headed into his field to be alone with the land, and contemplate this heartache. Such stories are now commonplace in Palestine and Israel, as renewed conflict has eroded the fabric of humanity that makes this place special in the first place. With the death toll climbing on both sides, Israel has decided to erect a large-scale separation wall designed to prevent Palestinians from crossing into Israeli territory. In reality, this wall is nothing more than a way to imprison millions of Palestinians by creating Bantustan-style enclaves, separating cities, villages and roads, and protecting settlements built in Palestine since 1967. Mas'ha is built a few kilometers outside of Israel proper, inside the West Bank. The separation fence does not follow the 1967 Green Line, and cuts deep within Palestinian territory. Mas'ha village is being physically split as a result of the wall, as well as numerous other surrounding villages. With such destruction at his doorstop, Na'azi decided to resist and take action. He met with other locals and organized a small demonstration with the support of a women's peace organization. 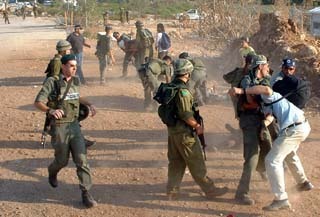 Soon after, a wide network of Palestinian, Israeli and International peace groups came to be involved, and a second much bigger protest was held in March 2003. This marked the construction of a peace camp right next to the path of the Mas'ha wall. When I arrived in early June, the villagers greeted me warmly and took me to the site of the peace camp. By this point, the camp had been running for two months straight, inhabited day and night by a mix of Palestinians, Israelis and Internationals. The Israeli army had also paid visits, not in the same spirit of solidarity. 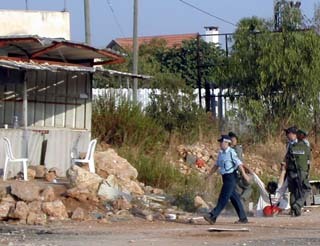 They declared the camp premises a "military zone" and demanded that all Palestinians leave immediately. When their requests were not met, they agreed that the camp could be inhabited during the day, but not at night. Still ignoring their demands, the army continued and continues to pay visits, photographing participants and questioning the organizers. Here we were, from all walks of life, gathering under the shade of an olive tree to get to know one another and become the peace we wanted to see happen. My life changed in the course of those three days I spent in Mas'ha. Coexistence was not some lofty ideal to be sought, but rather daily routine in keeping the camp clean, preparing meals, storytelling, joking around, and planning actions against the occupation and against the wall. I met some incredible people who mirrored that same spark of optimism, renewal and dedication to peace and healing that has been fueling my life in recent years. Zeiad, a Mas'ha villager who traces many generations here, admits to never having any knowledge of Israelis serious about peace before. His main experience of Israelis has always been from the surrounding settlements around his village, which saw the confiscation of his father's olive grove. Still, he joins the peace camp daily and dreams of the day when he and his people can live in a free and sovereign state unimpeded by settlements. Watching the wall being built is the hardest part of the experience. Everyday, more layers of barbed wire, ditches and concrete go up, and the village seems a little more sliced. The Israeli government has hired local Palestinians to construct the wall too. Seeing Arabs building a prison for themselves not only brings tears to my heart, but reminds me of the deep humiliation that is occupation. On my last day in Mas'ha, the locals invite me to tour Palestine with them and take a look at other villages and cities affected by the wall. As we curve our way through rugged back roads to avoid checkpoints, I am overtaken by the resilience and sheer beauty of Palestinian life, and the vision that has made it possible for me to be here. I leave with a renewed sense of vibrancy and courage, knowing that everything starts bottom up, and if we can do it in Mas'ha, we can do it anywhere. I spoke to Na'azi on the phone today. Getting to the camp is now more difficult, as the wall has encroached around the surrounding land. It has been decided that the camp will be moved to another part of Mas'ha, and the daily activities continued. Indeed, this sanctity of resistance endures and offers something that even the most ripened soul craves: nourishment to go on.